To help you get away from it all, Plein Soleil residence takes care of everything for you. Holidays with us are exactly what they are supposed to be : pleasure and relaxation for everyone ! What could be better than relaxing in the heat of a sauna after a day’s skiing or hiking ? Two showers made available to clients, one of which is reserved for the physically disabled. 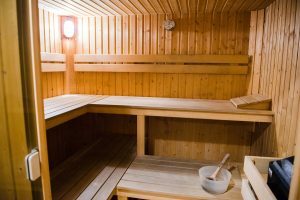 The sauna is open everyday, except for Sundays, from 5.30pm. The lounge is synonymous with relaxation. You can borrow books and games as well as sink into the arms of a comfortable armchair…you can also bring along your computer and connect to WIFI which is available in all the public areas in the residence. Open everyday. Making your life easier ! 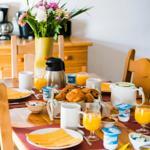 > Plein Soleil residence serves breakfast in the apartments. It consists of orange juice, a hot drink, a pastry and half a French stick with jam and butter. It is also possible to order only bread and pastries from reception the evening before. There is a launderette with a washing machine and tumble drier at your disposal. Price : 8€ per machine. >All clients are welcome to use the luggage storage room and the bike shed, both of which are kept locked. There are also locked ski lockers for those in need. >A private shuttle is organised in Winter between the residence and the nearby ski resorts. There is also a transfer service from the railway station in Modane to the residence. It’s easy to park here ! You can either leave your car in one of the two outdoor parking lots or book one of the 14 private underground parking spaces. Price : 35€ per week.